Hoy estoy super contenta de presentarles mi nueva aventura. 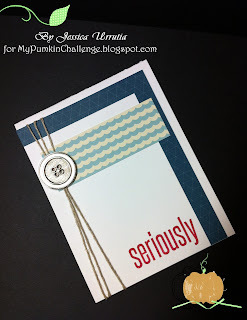 Abri un blog de retos llamado My Pumpkin Challenge! Hoy es el primer reto para todos aquellos que ya estan jugando con sus productos de los kits de My Paper Pumpkin y queriendo mas ideas, mas muestras, mas alegria! You would make my day by visiting and leaving me a comment over there!! Me haria el dia si me visita alla y hasta me deja un comentarito alli! Hice mis botoncitos, banderas y fondos digitales con Mi Estudio Digital. Tan feliz de tener a Stampin'Up! you will love the Designer's Team. Maybe you are next! te va a encantar lo que el Equipo de Disenadoras hizo. Tal ves tu eres la proxima! What do I need to do to participate? Is simple, go to the My Paper Pumpkin website HERE and subscribe to the monthly fun kits. Now is even easier to subscribe. Will take you to my own subscribers page as your demonstrator. As soon as you get your products you will have about 10-11 days before the new challenges is up. Challenge will start every 1st day of the next month after you receive your package. Create and post your creations there. You may win a badge and also occasional Giveaways! I got my April's kit close to the 21st of the month (in Texas), so the 1st of May I was ready for this challenge. Come and join me! Participate or just get isnpired...there are so many cool and creative demonstrators and crafters out there I wanted to bring them all together to one place so you could be inspired and it becomes easy for you to create simple to out-of-the-box projects with the My Paper Pumpkin line. Ready, set, craft! Es simple, solo ve a mi sitio de web AQUI y subcribete a los kits mensuales. Ahora es hasta mas facil de subscribirse pues vas directo a mi pagina de membresia. Tan pronto como tenga sus productos tendras entre 10-11 antes de que comience el reto. El reto comenzara cada primero del mes y puedes postear tus creaciones alli. Podras entrar para ganarte una medalla o un regalo escogido al azar por participacion. Yo recibi mi kit cerca del 21 de abril y pues el reto comenzo hoy. Participa o solo ve para ser inspirada...hay tantas demosntradoras y gente creativa con estos kit que quice abrir una lugar donde todos se puedan inspirar. Asi se te hara facil hacer proyectos simples o fuera de la norma con tus nuevos kits de My Paper Pumpkin. En sus marcas, listos, a crear! I used a Basic Black Marker to handwrite "You rock!" The only thing I added to my kit was Whisper White CS for my base. Love these papers! Lo unico que le anadi al kit es la cartulina Whisper White para la base. Me encanta estos papeles! Thanks a Million for your visit and kind comments. Gracias mil por su visita y sus amables comentarios. Su Demonstradora Independiente de Stampin'Up! Love your card Jessica! The Seriously really stands out on the whisper white! It is so fun to see what everyone creates! 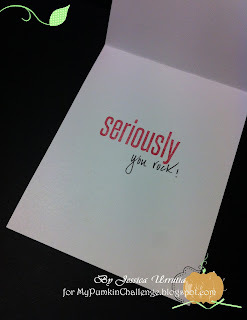 New Stampin'Up! Catalog is here! Cards you don't want to miss! What can I do with My Paper Pumpkin? Great Gift Idea for you and your Fancy Friends! Fun Rosette Tutorial for you!